Our parcels are specially designed in order to preserve the freshness and quality of our products while protecting them. As your cheesemonger does it, our cheeses are traditionally packed to preserve their quality and delicacy. The most sensitive cheeses are even vacuum-packed to improve their preservation during the shipping. 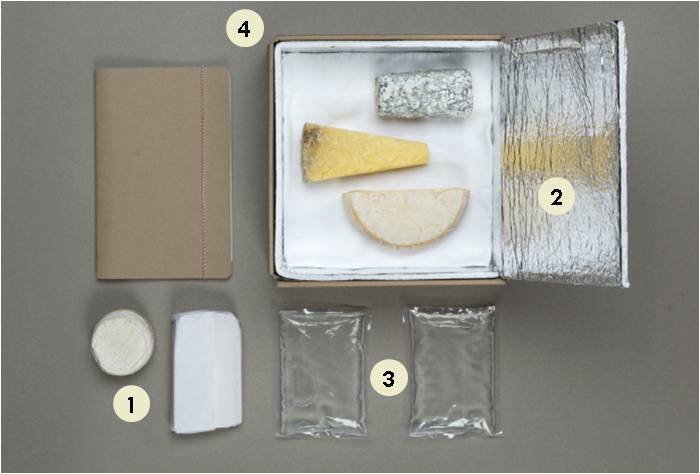 Once packed or vacuum-packed, the cheeses are placed in a refrigerated box containing eutectic gels, allowing a temperature between 4°C to 8°C throughout the whole delivery. The refrigerated box is then placed in a Les Nouveaux Fromagers cardboard box to protect the cheeses during the transport. The cheeses are packed in a greaseproof paper. Some cheeses are cellophane-wrapped (ex. Gorgonzola) or are vacuum-packed. The cheeses are placed in an refrigerated box. Eutectic gels are placed in the refrigerated box to keep a temperature below 8°C. The refrigerated box is placed in a Les Nouveaux Fromagers cardboard box to protect the cheeses.